Join the team now for a chance to score the winning touchdown and win a hefty prize. Click here to play! It's going to be a big game day full of screaming fans, cheerleaders, foam fingers and beer. You'll have to play some smart football in order to take down this win. Keep your eye on the prize. The Super Bowl Trophy is what you're looking out for as it doubles your prizes if it appears in a winning combination. It also acts as a substitute symbol to help you create more winning lines. Spin five pro players and you'll win 4000 times your original line wager. Two to five helmets win up to 1000 times your wager, and five whistles win 500 times your wager. Also keep an eye out for those cheerleaders, beer and foam fingers, as all of these game day musts will help you to win big. Of course there wouldn't be a game without the ol' pigskin. These football icons act as scatters an will trigger the halftime show bonus in which you'll be kicking field goals for free games and multipliers. So, suit up and get out on that field to play hard and win big. Three or more footballs anywhere on the board will trigger the bonus game. The Trophy symbols act as substitutes. These will replace all other symbols excluding the scatters. Prizes are doubled when this icon appears in a winning combination. Three or more footballs will activate a field goal bonus game. 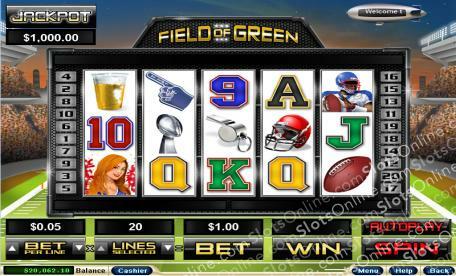 You get to kick footballs to win free games or multipliers on your total wager. Prizes are doubled during the free games.